My trusty Acer Travelmate 4020, which served me well for about two years as a terrific hand-me-down from the O'Malleys had started recently getting twitchy on me. Screen-scrambling crashes and random hard-drive failures started becoming more irritating and semi-dangerous (due to losing data from my new book), and when I attempted to reformat and reinstall the entire thing, I got first hobbled by a bad set of recovery discs, and then by the thing's apparent unwillingness to accept any video or audio drivers. The minute I tried installing any of the motherboard drivers, it didn't matter what it was, the Windows XP pro installation would get all wonky, crash to a blue screen, and be inconsoleable until I reformatted and reinstalled again. So, basically I ended up with a useless and slightly pathetic paperweight that would take (after about an hour and a half each try) a full XP install, but then stare at me mutely with no sound, no DVD, no Office suite, no internet... nada. I tried to maintain a good attitude about this. 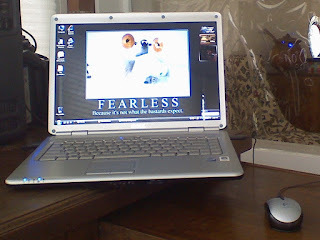 After all, the only reason I had the laptop to begin with was sort of on a lark when the O'Malleys had an extra one. I had lived up to two years ago perfectly content and happy without one. As anyone who owns and regularly uses one will tell you, however, it only took a matter of hours before I started feeling like my right arm had been cut off. I used that little Acer constantly. So much, in fact, that I'm slightly surprised that it survived as long as it did. In any case Beth, proving once and for all that sometimes she can pick exactly the right moments to turn on my favorite of her personality characteristics (Enabling), gave me a winning smile and said "let's go to Sam's club and see what they have there." I actually ended up finding the winning combination at Best Buy of all places. I priced out a similar laptop on the Dell website, and they had a somewhat cheaper version of the same model I have with fewer features, and a significantly more expensive model with slightly more features, but no middle-ground. Best Buy, in a rare showing of good sense, actually carries a special configuration of the machine that I'm using that has a good combination of memory, storage, features, and best of all, a reasonable price. So I didn't cheap out, but I got a good deal. The newer generation of Dell laptops is thinner, lighter, and much more user-appropriate than the previous. This little baby has basically only the features that you need, and does away with the ones that the other 99% of computer users don't need. I'm still getting used to Vista, but since it's the better version of the software and came pre-installed so I didn't have to deal with doing it myself, it seems to run very stably and smoothly. What didn't take me long to get used to is the gorgeous ultrabrite glossy screen. What a relief on the eyes.